This guidance is for sponsors of surgical mesh medical devices. If you import and/or supply these devices, you need to know about the regulatory changes that will impact your product. The Australian Government has strengthened the assessment of surgical mesh medical devices by approving regulatory amendments that reclassified all these medical devices from Class IIb (medium) to Class III (high risk). This decision is consistent with the recommendations from the Expert Review of Medicines and Medical Devices Regulation (MMDR) to align (wherever possible) the Australian classification of medical devices with the European Union framework. The Australian Government has made the decision to reclassify surgical mesh devices ahead of Europe due to the serious concerns about risks associated with the use of these devices. These amendments do not affect any surgical mesh medical devices that contain tissues, cells or substances of animal, or microbial, or recombinant origin, or stable derivatives of human blood or human plasma, or a substance that, if used separately, might be considered to be a medicine, or devices intended to be wholly, or mostly, absorbed by a patient's body or undergo a chemical change in the body, as these devices are already Class III medical devices in accordance with Therapeutic Goods (Medical Devices) Regulations 2002. Surgical mesh medical devices are a variety of surgical implants usually used in the repair of soft tissue, or mixed soft tissue/bony structural defects, to support organs and tissues or to strengthen the integrity of a body cavity. They may be constructed from a range of absorbable or non-absorbable materials (e.g. metallic mesh, flexible synthetic or organic materials etc. ), may have different forms (e.g. solid sheet, matrix, woven or knitted, etc.) and shapes (e.g. sheet, sling, tape, etc.). Surgical meshes are generally designed to be integrated into the structures they support. Types of Hernias: Inguinal - occurs in the inner groin; Femoral - occurs in the upper thigh/outer groin; Incisional - occurs through an incision or scar in the abdomen; Ventral - occurs in the general abdominal/ventral wall; Umbilical - occurs at the belly button; Hiatal - occurs inside the abdomen, where the stomach pushes up through the diaphragm. Mesh-like implants used for compensation of bone loss or repair of structural bone defects (e.g. acetabulum cages, cranial mesh, or mesh used in facial (mandibular or zygomatic) bones repair) are not considered as surgical meshes. See page 7 for the definition of a pre-commencement entry. Review all your existing ARTG entries for surgical mesh medical devices and/or all applications you have submitted to the TGA seeking pre-market authorisation for your surgical mesh medical devices. You must notify the TGA about all your surgical mesh devices included in the ARTG as Class IIb devices. If you failed to notify the TGA within this prescribed period, the transitional provision will no longer apply to your device. If you have a urogynaecological mesh entry in the ARTG and you want to continue supply the device, you must submit an application for inclusion of your medical device in ARTG as a Class III by this date to the TGA. If your medical device is any other type of surgical mesh, you must submit an application for inclusion of your medical device in ARTG as a Class III by this date. If TGA did not receive your Class III application within this prescribed period, the transitional provision will no longer apply to your device. Any application for inclusion of a surgical mesh in the Australian Register of Therapeutic Goods (ARTG), submitted to the TGA on or after 1 December 2018, must be submitted as an application for a Class III medical device. You must use the Class III TGA Business Services Device Application form. 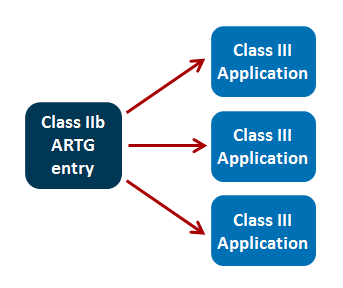 Any application for ARTG inclusion using a form other than a Class III TGA Business Services Device Application will not pass preliminary assessment. regardless of whether the commencement date for the ARTG entry was before or after 1 December 2018. Sponsors of ARTG pre-commencement entries will have time to notify the TGA about all surgical mesh devices included in their Class IIb ARTG entry/entries, and to submit an application for inclusion of their surgical mesh devices in the ARTG as a Class III. By the date that is two (2) months after the start day/days of your ARTG entry/entries. It's preferable that this information is provided as an Excel spreadsheet. If you do not comply with this requirement by the due date as applicable, your devices will no longer be eligible for the transitional provision, and you will be required to stop importation and/or supply of your devices immediately. If you decide to seek pre-market authorisation for your device at a later date, you will be required to submit an application for inclusion of a Class III medical device in ARTG as per the usual application process. If you are unsure whether your device comes within the category of surgical mesh medical devices, and therefore whether you are required to notify the TGA, we advise that you provide information about your device and give reasons on why you consider your device is not subject to the reclassification requirements. For all other surgical mesh: until 1 December 2021. Sponsor has three (3) devices of the kind included in this ARTG entry with three different UPIs. Submit three Class III applications for inclusion of each individual surgical mesh (individual UPI) in ARTG by no later than 1 December 2021. If you meet both requirements within the specified timeframes, you may continue supplying your devices in Australia until all your respective Class III applications are finalised. If your Class III applications are successful, your respective surgical mesh devices will be re-included in the ARTG as three individual Class III medical device entries. After you receive notifications of your new Class III ARTG entries, you may request TGA to cancel your related Class IIb ARTG entry. Otherwise, TGA will make a decision regarding cancellation of your Class IIb ARTG entry on our own initiative. If one (or all) of your Class III applications is/are unsuccessful (lapsed or a decision is made not to include the device in ARTG), or you decide to withdraw your Class III application, you will no longer be able to supply the device(s) in Australia. The TGA will make a decision regarding the cancellation of your respective Class IIb ARTG entry. The application is finalised, and the kind of device is included in the ARTG on 1 April 2019. After you have received your ARTG entry, you may start importing and supplying your medical device(s). Submit a Class III application for inclusion of each individual surgical mesh (individual UPI) in the ARTG before 1 December 2021. For the remaining part of the process, refer to Example A. If at least one of the requirements (notifying the TGA and/or submitting a Class III ARTG inclusion application) is not met by the relevant date as specified in Therapeutic Goods (Medical Devices) Regulations 2002 , you will no longer be able to manufacture, import and/or supply your surgical mesh in Australia until you reapply and (if successful) re-include your device in ARTG as a Class III. Only devices of the same kind can be supplied under one ARTG entry. have the same Global Medical Device Nomenclature (GMDN) System Code. In addition to the above characteristics, devices of the same kind must have the same unique product identifier (UPI). The devices of the kind you have included in your Class IIb ARTG entry may have different UPIs, and therefore may no longer be of the same kind as Class III medical devices. Each Class III medical device with individual UPIs will require a separate application for inclusion in ARTG. variation does not change the intended purpose of the device (for example, surgical meshes of the different size). The application must be made electronically via the TGA Business Services (TBS) client's portal. It must be made in accordance with a form and manner approved for the classification of a medical device (there are separate forms approved for different classifications and as the sponsor, you must select correct form for the Class III device). For further information, go to Application requirements for medical devices - preliminary assessment. The application fee must be paid. The application must be accompanied by the kind of information prescribed for the application of this classification by legislative instrument and provided in an approved form. You must have the appropriate conformity assessment documents demonstrating the application of the conformity assessment procedures or comparable procedures to the device and provide these documents with the application for inclusion of your medical device in ARTG. For further information, go to Application requirements for medical devices - preliminary assessment. The applicant must certify the section 41FD matters. The Class III application fee is payable. Application fees are listed in the TGA's Schedule of fees and charges. intended for the same clinical indications. The conformity assessment procedures, or comparable procedures, set out the requirements relating to the application of manufacturers' quality management systems for medical devices and other requirements imposed on manufacturers, specifically in relation to the design and production of medical devices. the type examination procedures and the production quality assurance procedures (Regulation 3.6(2) of the Therapeutic Goods (Medical Devices) Regulations 2002 ). MDSAP certificate and an order approving an application for premarket approval under section 515 of the US FDC Act (PMA). If you require clarification about conformity assessment documents that you need to provide with your application for inclusion of your surgical mesh medical device in ARTG as a Class III, or if you are not sure if the conformity assessment documents that the manufacturer has are appropriate, you may contact the TGA and seek advice. TGA will consider your manufacturer's conformity assessment documents, and will discuss possible options with you. Providing correct conformity assessment documents is one of the important requirements to ensure your application is not refused. Applications for ARTG inclusion of Class III medical devices (for which a TGA-issued conformity assessment certificate is not in force) must be selected for audit. The level of audit (Level 1 or Level 2) may depend on the category of a medical device and the overseas regulator conformity assessment document(s) provided with the application. Class III application must be selected for audit and the audit assessment fee is payable. clinical evidence for the device. Guidance on requests for abridged assessment is available on the TGA website. An ARTG inclusion application is submitted for Class III medical device for which the manufacturer has US FDA Pre-Market Approval (PMA) (there is no TGA-issued conformity assessment certificate for this device). The Class III ARTG inclusion application passes preliminary assessment and it must be selected for application audit. There are other signals that raise safety or performance concerns. It is your responsibility to demonstrate that the overseas conformity assessment document has been issued for exactly the same medical device. None of the criteria for Level 2 audits apply, the application will usually undergo a Level 1 audit. You must comply with the essential principles and must have sufficient information to demonstrate compliance. The Class III application fee and compulsory audit assessment fee will be applicable to all Class III applications for surgical mesh medical devices. If the device is included on the ARTG, Class III annual charges will apply. Please refer to the TGA's website for the relevant fees and charges. Some sponsors list their devices on the Prostheses List in order for the devices to be reimbursed by private health insurers. When the TGA reclassifies a medical device, a new ARTG entry is assigned. If your Class III ARTG inclusion application is successful and you received a new ARTG entry, you will be required to update your Prostheses List listings in order to remain on the Prostheses List. Failure to maintain the currency of 'Billing code' details in the Prostheses List may result in discrepancies between private hospital records and the Prostheses List. These discrepancies may result in benefits not being paid by private health insurers. To update the Prostheses List with your new ARTG numbers, you will need to submit an Amendment Application using the Prostheses List Management System (PLMS) for each of the affected Billing codes. When submitting an Amendment Application, please ensure that you clearly advise the reason for the change and include relevant supporting documents that clearly identify the required changes. Catalogues (with any changes highlighted). For any queries about amending your Billing code on the Prostheses List, please contact the Prostheses Hotline (02) 6289 9463 or email: prostheses@health.gov.au. What will happen after successful completion of the assessment of my Class III application? If your application(s) for reclassification of surgical mesh devices are successful, and all your devices are included in ARTG as Class III, you will no longer require a Class IIb ARTG entry and this entry may be cancelled. We encourage you to request cancellation as soon as possible to prevent paying unnecessary annual charges. Otherwise the TGA may make a decision regarding cancellation on our own initiative. You will continue to be required to pay annual charges for the Class IIb ARTG entry until it is cancelled. What will happen if my Class III application is not successful? If your Class III application is not successful, you will be notified of the decision in writing and you will be provided the reasons for the decision. If you are not satisfied with this decision, you may request reconsideration of this initial decision under section 60 of the Therapeutic Goods Act 1989 within 90 days of the decision. If you are not satisfied with the reconsideration (reviewable decision), you may apply to the Administrative Appeals Tribunal or the court. Once the final decision regarding your Class III application is made (i.e. it is finally determined), the TGA will make a decision regarding cancellation of your related Class IIb ARTG entry. Can I continue supply of my surgical meshes in Australia after the end of the transitional period if the audit assessment of my Class III application is not finalised? If you notified the TGA about the unique product identifiers (UPIs) of devices supplied under the pre-commencement Class IIb ARTG entries and submitted Class III ARTG inclusion application(s) within the required timeframes and your Class III application is still under assessment by TGA, you can continue supply of your devices under the Class IIb ARTG entry until the decision on your Class III application(s) is made. To pass preliminary assessment, an application must meet the requirements in section 41FDB of the Therapeutic Goods Act 1989 . The TGA will carry out an assessment of whether the requirements have been met for each application. Applications that do not pass preliminary assessment will be refused.